The earliest known postal cards can be traced to the 1840s. The first known postcard with a printed picture on one side was created in France in 1870. The first American postcards were introduced in 1873, but the U.S. Government quickly established a monopoly, permitting only the Post Office to print postcards for mailing in the U.S. By 1875, postcards were being mailed internationally. The first privately-printed souvenir cards were introduced for the Chicago World’s Fair in 1893. The Post Office, however, continued to maintain their monopoly on mailing cards, prohibiting privately-printed cards from being sent through the mail. In 1898, the government allowed privately-printed cards to be sent through the mail, but prohibited them from using the words “post card.” Privately-printed mailing cards had to be called “souvenir cards” and be imprinted with the words “Private Mailing Card” on the back. 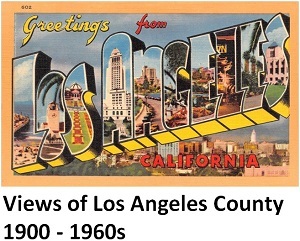 The Los Angeles Almanac Postcard Collection does not include any postcards from this period. This is the era where the Los Angeles Almanac Postcard Collection begins. This was known as the “Undivided Back Era.” In 1901, the U.S. Government finally allowed privately-printed mailing cards to use the words “Post Card.” Only a mailing address could be written on the back, however. Senders had to write any message on the front of the card. 1908; Published by M. Rieder, Publ. Los Angeles, Cal. This was known as the “Divided Back Era” and the “Golden Age of Postcards.” Postcards during this period began featuring a back divided in which to write a message and the mailing address. Through this period, many American postcards were printed in Germany due to the exceptional printing quality of German printers. The period became known as the “Golden Age of Postcards” because postcards became a popular craze that lasted until the U.S. went to war with Germany in World War I. 1915-1930 - White Border Era or "Golden Age of Postcards"
Circa 1915-1930; Published by Western Publishing & Novelty Co, Los Angeles, Cal. This was known as the “white border” era. Due to wartime shortages during World War I, postcards images were reduced in size and surrounded by a white border so as to save ink. This practice continued even after the war ended. Also, as a result of the war, American postcard publishers had lost access to high quality printers in Germany. Their postcards had to be printed at home or in Britain, but often with lower quality images. Yet, even after the war, the earlier American practice of printing postcards overseas did not resume. 1935; Published by Western Publishing & Novelty Co, Los Angeles, Calif. This was known as the “Linen Era.” The quality of postcard paper greatly improved, offering a linen-like texture and more vibrant colors. Many of these cards continued to feature a border (although it no longer had to be white). 1950s; Published by Western Publishing & Novelty Co, Los Angeles, Calif. This is known as the “Photochrome Era.” Postcards began offering glossier, photographic images. Scalloped edges were also introduced. Postcard sizes also began to increase. This era continues today. Most of the postcards in this collection that still remain to be added to this exhibit are from this era. Some early postcards were actual photographs printed on postcard paper. These were known as "Real Photo Postcards" and were not the same as photochrome postcards published after 1945. Typically, the photographs in real photo postcards were black and white.